Published by Mikro under news,Planets on Sep. 10. 2010. Contact has been lost with the planet. Some images show destruction from bombardment but no solid info is available. Check out the official news item here and you can see the screenshots and concept art of the new planet in our galleries below.. Published by Mikro under news on Sep. 03. 2010. … Also check out the media section to see screenshots, concept art, and wallpapers portraying these heroic battles in space. Published by Mikro under Jedi Knight,video on Aug. 13. 2010. This Friday’s update has provided us with details on the advanced class choice you can make as a Jedi Knight. As seen in the scanned PC Gamer footage the advanced specializations are the Sentinel (dual lightsaber wielding damage dealer) and the Guardian (tank and buffer). Official’s site Holonet Jedi Knight page has been update with the new information. It has also been revealed that the associate for Jedi Knights will be the Astromech T7-01 droid. He got his own Holonet page as well in the biographies section. The awesome trailer of the Jedi Knight class, that has been released alongside this update, shows that Jedi Knights will start on Tython. They will have some sort of force jump ability to get them up close and personal with their enemies (sort of like a warrior charge in WoW). There seems to be some sort of a buff ability for troops around the Knight (in that trooper scene). Saber deflection of laser fire is probably higher if you are a Guardian. Saber throw is another skill seen in the video as well as some sort of Chuck Norris high kick! I also must note that the graphics are looking mighty sweet and things look a lot more polished. From the look of things this is the class I personally will be going for. Published by Mikro under Planets on Jul. 31. 2010. Although it is not technically a planet, it still is a celestial body we’ll be able to quest on. The largest moon of planet Hutta is also home for the smugglers of the Exchange. Put the Hutts and the Exchange on a moon full of casinos, bars and a black market located deep bellow the shining lights of the city’s exterior and you have a perfect place for a shady adventure. 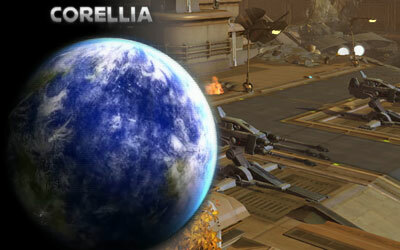 Nar Shaddaa is the next “planet” reveal we got during this Friday update. You can see its official HoloNet page here and you can view the planet gallery below. This Friday also brought the continuation of the Blood of the Empire Comic. Published by Mikro under music,news,video on Jul. 16. 2010.